All information necessary to setup manual accounting records is also necessary to setup and install QuickBooks on your desktop or online. This task is even more complicated if you switch from manual accounting operations to QuickBooks in the middle of the year. Install software, design and set up chart of accounts and entire accounting package, accounts receivable, inventory, accounts payable, etc. Entering your ending statement bank balances and outstanding checks & deposits in transit as of your starting date. Entering your transactions since your starting dates into QuickBooks. Follow up training to ensure the client is “on the right track”. Monthly, quarterly or annual review of client QuickBooks data to assist in tax preparation and management reports. 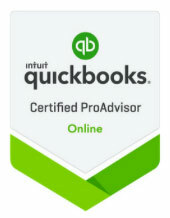 Let's get your QuickBooks setup!